Does Fast Page Speed Increase SEO? Studies show that conversion rates drop significantly with every second the viewer has to wait to see your website. Imagine you’re flicking through channels on the radio on your way to work. When an ad comes on—even if it’s on your favorite station—how long will you endure listening to the ad while waiting for the music to return, before flicking to the next station? Not very long, right? Ten seconds? We’ll bet it’s much less than that. Fast page website speed not only helps with traffic and user experience and, therefore, conversion rates, it also helps with search engine optimization. First of all, how does search engine optimization (SEO) work? You’re probably familiar with the basics. Search engine optimization is a way in which you can improve how a search engine like Google or Yahoo brings users to your website. How high your website appears, given certain search terms, depends on a few factors. Keywords used in the content of your site determine how well the search engine can put your website into the proper categories so that it is able to match your site with a viewer that is looking for what your site offers. The idea is that if your site uses the keywords people are searching for, then it should have information relevant to what the person searching wants or needs. Some websites are simply ads and scam the system by using keywords in a nonsensical way, merely to trick viewers into looking at the site. These search engines want to make their users happy by bringing them websites that will be useful to them as quickly as possible. Page load speed has been a part of Google’s search engine algorithm since 2010 and as user experience is directly correlated to site speed, Google in fact ranks site speed against competing websites and applies it to the sites ranking on the search engine. This is because the more popular web pages—the ones more likely to be useful to users and to attract site views—tend to load faster. Google doesn’t rank them higher solely because of the load time (although they have also confirmed webpage speed is a ranking factor); these websites naturally rise to the top because they’re creating good user experiences, but can also be enhanced with good SEO tools. To keep your car running smoothly, you’ll want to bring it in to get its oil changed regularly and its tires rotated, to make sure your car is running efficiently. With regular upkeep, you’ll be getting more bang for your buck when it comes to website hosting and maintenance of other aspects of your brand like blogs or social media that direct viewers to your website. This is why website speed monitoring is essential to any website looking to increase their SEO. There are two main parts of page loading. One is how soon you can begin interacting with the page. All the pictures may not have come in yet and the buttons don’t appear or having something like a question mark or a box in place of the button, but you can begin clicking through the site. The second is how long the web page takes to load completely. With fast Internet, the difference may be negligible, but with slow Internet (people accessing the page from an Internet cafe or from their phone in a different country, for instance), slower wait times can be incredibly frustrating and will reduce the amount of traffic to your site. While fast website load times both reduce operating costs for users and improve user experience, they don’t have the same effect in terms rankings as factors such as keywords or page relevance. However, we can be sure of one thing: page loading times do have a relationship when it comes to customer loyalty and conversion rates. Faster page loading times have a big effect on your bottom line, no question. KISSmetrics says that two in five people will give up on a site that keeps them waiting for more than three seconds. They also report that one in two consumers says that how fast a page loads, impacts their trust in a brand and their loyalty to that company. Imagine if relationships were like this. If your boyfriend waited for more than three rings to answer the phone, you’d hang up. Imagine if how quickly she answers the phone determines how much you’d trust him. If he didn’t answer a text or took too long to answer, you’d be much less likely to try calling him again. This is a drastic example, but it is often somewhat true. Human beings are gratified by instant results. We know what we want and we want it now. If we have to wait for a response, whether from a website or a person, we tend to become frustrated. With programs like Snapchat, Instagram (where “instant” is implied in the program’s name), and Twitter, we’re used to instantaneous feedback, whether through likes, views, replies, or retweeting. And we expect the same from the companies we’re investing our hard-earned money in, especially when we are likely to share the experience, whether in person or online, with friends and family. If we purchase a ski jacket or a mountain biking helmet online, we’re likely to post images of us wearing that brand. The experience of seeing the brand online and out in the world, deciding we want to be a part of the brand, making the purchase, and showcasing this new product (posting pictures of us dropping cliffs in the new jacket or riding along the coastline in the new helmet) should be seamless, exciting, and, overall, satisfying. Slow website speeds and sites that don’t function well don’t cohere with the seamlessness and ease with which we want to absorb this new product into our lives. Any hiccups along the way and we become frustrated with the experience, which affects our perception of the brand. 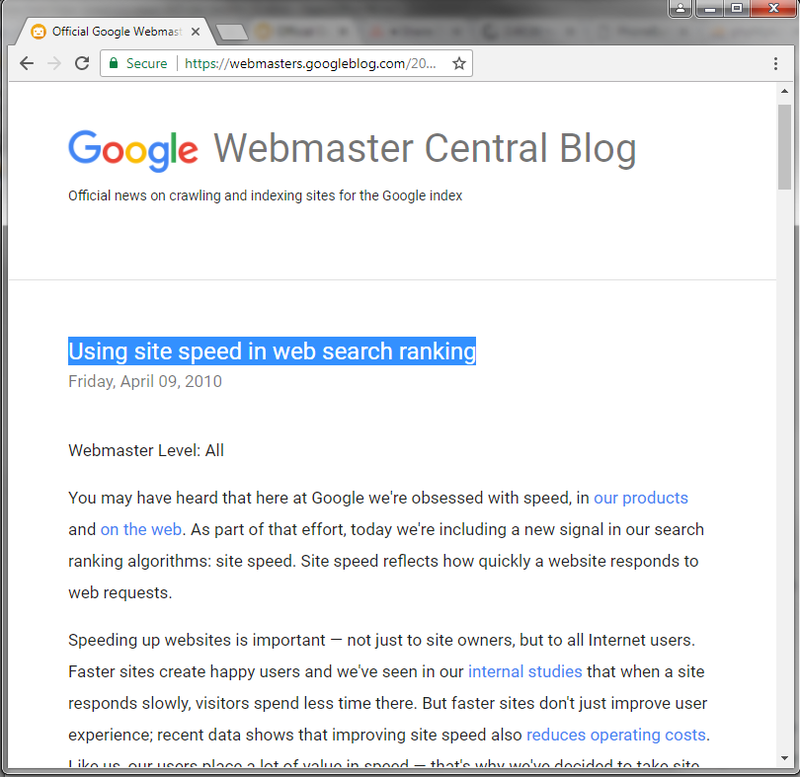 So, if major search engines are taking page load speed into account, you definitely should be, too. Automate your website’s speed testing with MachMetrics – and start getting detailed speed trend data so you always know how your site is performing. I liked your article on website speed. Thank you for your beautiful presentation.We know the website will be as fast as Google will look better on our site, and will rank our site very quickly. How Does Page Load Time Affect Your Site Revenue? MachMetrics on Average Page Load Times for 2018 – How does yours compare? Mel on Average Page Load Times for 2018 – How does yours compare?